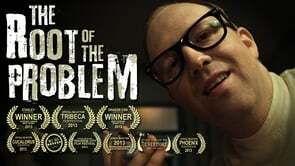 The Root Of The Problem is a great small horror short film that does enough to make you enjoy it and end up wanting more. We follow a women in a dentists office in the 1950’s. Weary of her visit she soon starts seeing odd things while in the office and suspecting that her ever so friendly dentist might have more sinister objectives then one would assume. Is there actually something evil happening though or she just having a bad trippy reaction from the anesthesia. The film follows a nice pace with some suspense to keep you intrigued while at the end leaving you to question what actually happened. For being a small short film as well the little special effects and makeup they have looks great. Thankfully as well the three actors in the film do a good enough job as well to not drag it down. Overall The Root Of The Problem is a great short horror film and running at 14 minutes well worth your time.